Paulistanos (natives of São Paulo) often find the need to escape the concrete megalopolis of 20 million people and enjoy a weekend in a more relaxed and rural setting. Serra Negra is one such popular destination in the interior of the state of São Paulo that offers both laid back charm and bucolic scenery. Serra Negra is a city of approximately 25,000 residents, located in the Serra da Mantequeira mountain range, approximately 150 kilometers northwest of São Paulo, and close to the border of Minas Gerais. Serra Negra started out in 1828 as a modest outpost for travelers between São Paulo and Minas Gerais, but grew in population in the late 19th century with Italian immigrants who came to work on the nearby coffee plantations. It became a spa town in 1928 when mineral springs were discovered there. Today, Serra Negra remains a favorite weekend getaway spot for paulistanos, but appears to be somewhat undiscovered for foreign tourists. When I visited, I felt like one of the few English speaking tourists there. If you can manage the language barrier, Serra Negra and the surrounding area makes for a fun and relaxing place to spend a weekend. 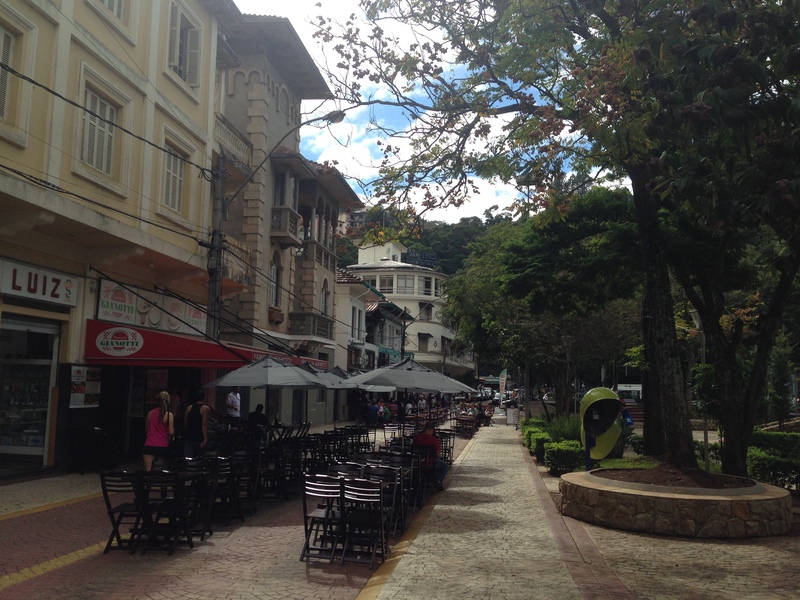 The center of Serra Negra is much like any pleasant, touristy town, with main streets lined with shops, cafés and restaurants. On busy weekends, visitors fill the sidewalks and squares. Prices in Serra Negra overall seemed to be quite a bit less than what I found in São Paulo. For example, my friend and I were both able to get coffee and cake at the Brazillian Coffee café (yes it is actually misspelled for some reason) for the equivalent of $6 combined, quite a bit less than cafe and dessert at Suplicy in Jardins. 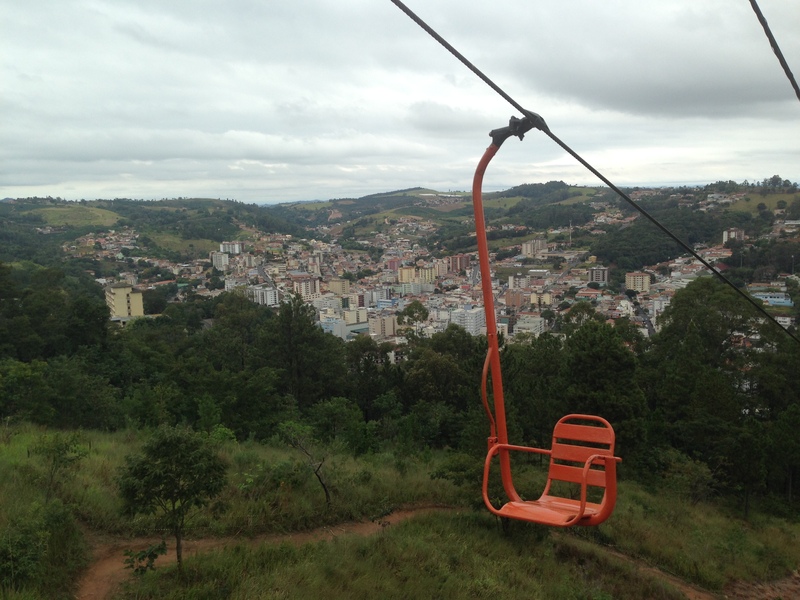 One of Serra Negra’s most popular attractions is the Teleférico Serra Negra, a chair lift that, for the price of R$12, whisks you up to the top of the 1,080 meter Pico do Fonseca in fifteen minutes. Some people find the ride terrifying, but if you’ve been on a ski lift before it’s quite similar. The mountaintop has its own version of Christ the Redeemer and panoramic views of the valley below. You can either ride back down the chairlift or ride a horse down the mountain instead. 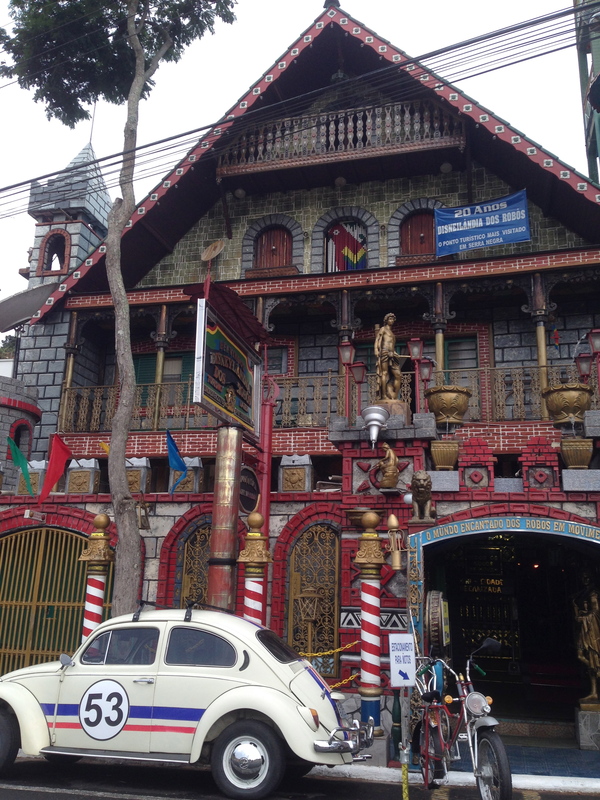 The park at the bottom of the Teleférico has a delightfully kitschy candy store. Disneylândia dos Robôs isn’t affiliated with Walt Disney at all, but it is a really fun place to go and admire the impressive collection of mechanical toys made from scrap metal that the owner has put together. It is an eclectic place that engineering geeks will love. Much of the appeal of Serra Negra resides in its surrounding countryside. My friend and I spent one morning exploring a trail near the estância where we stayed to explore a cachoeira (waterfall). 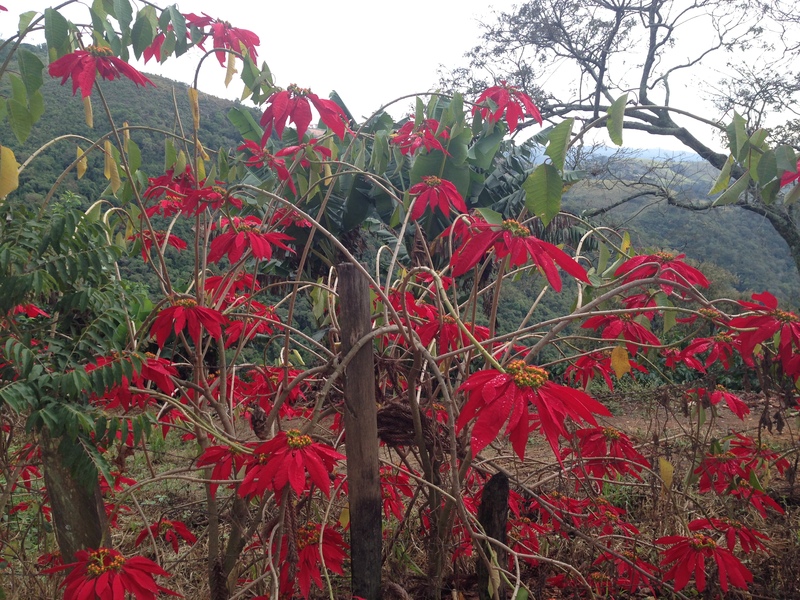 We branched onto a dirt road that led past an abandoned chapel and up through coffee plantations. Showy flowers lined the sides of the road. Once we got to the property where the waterfall is located, we noticed a sign saying that we needed to pay R$15 just to enter the gate and see the waterfall. Thinking the price a bit too steep, we decided against it, but the walk there was worthwhile in and of itself. Have you been to Serra Negra? Please share your experiences. tenho 19 anos, nunca sai do estado de sp….